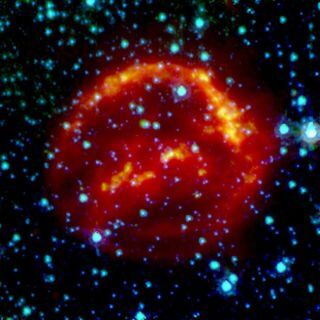 This false-color image of Kepler’s supernova remnant combines data taken in X-rays (Chandra X-ray Observatory), visible light (Hubble Space Telescope) and infrared radiation (Spitzer Space Telescope). Nicolas Dauphas, from the University of Chicago, and his colleagues have been analyzing meteorites for the microscopic remnants of a supernova that exploded approximately 4.5 billion years ago. A meteoritethan landed on Earth nearly 150 years ago has been found to contain microscopicshrapnel from a star that exploded about the time our solar system was born. The chemicalcomposition of the Orgueil meteorite, which struck France in 1864, indicatesthat a nearby star exploded in a supernova around 4.5 billion years ago, rightwhen the sun's planets were forming. From the faint remnants of the stellar explosion, researchers are now in position todetermine what kind of star exploded. The researchcould solve the mystery of why levels of a metallic element, chromium, vary fromone planet and meteorite to the next. The study ofthe meteorite, which is embedded with rounded grains and is known as achondrite, was led by University of Chicago researcher Nicolas Dauphas. Thefindings are detailed in the Sept. 10 issue of the Astrophysical Journal. Previously,scientists believed that chromium 54, which is an isotope of the element, and otherchemical elements were evenly dispersed throughout the cloud of gas and dustthat collapsed to form our solar system. "It wasa very well-mixed soup. But it looks like some of the ingredients got in thereand didn't get completely homogenized, and that's a pretty interesting result,"said Bradley Meyer, a professor of astronomy and astrophysics at ClemsonUniversity, who did not work on the new research. For fourdecades, scientists hypothesized that a supernova explosion occurred about 4.5billion years ago, possibly triggering the birth of the sun. "Itseems likely that at least one massive star contributed material to the solarsystem ? or what was going to become the solar system ? shortly before itsbirth," Meyer said in a statement. Inside themeteorite, traces of the chemical elements aluminum 26 and iron 60 ? twoshort-lived isotopes found in space rocks but not on Earth ? ?had ledresearchers to think they came from a core-collapse supernova, which is classified as a "TypeII" event, describing a massive star that undergoes an internal collapseand violent burst. A Type IIsupernova occurs when a star at least nine times heavier than the sun burnsalmost all of its fuel. The fusion engine in the center of the star begins tostutter, which triggers an internal collapse, followed by a violent explosion of the entire star. By contrast,Type Ia supernova explosions occur in the death of a small butextremely dense white-dwarf star in a binary system (in which two stars orbiteach other). Type IIsupernova grains have been found in meteorites before, but until now, residualmarkers from a Type Ia supernova had never been detected. Scientists willnow be able to analyze grains in the French meteorite for chemical markers thatwill help determine which type of supernova contributed to the rock's chromium54 content. "Thetest will be to measure calcium 48," Dauphas said. "You can make itin very large quantities in Type Ia, but it's very difficult to produce in TypeII." If themeteorite grains contain lots of calcium 48, then it probably came from a TypeIa supernova explosion. Researchersin this field ? known as cosmochemists ? have sought the carrier of chromium 54for 20 years, but recent advances in instrumentation suggest the answer mayarrive soon. The grainsmeasured in the study were less than 100 nanometers in diameter, about athousandth of the width of a human hair. The findingssuggest that after the supernova released these grains into space, dynamicalprocesses in the early solar system sorted the fragments by size, whichled the grains to become disproportionately incorporated into the meteoritesand planets that were beginning to form around the sun. "It'sremarkable that you can look at an isotope like chromium 54 and potentiallyfind out a whole lot about what happened in the very first period of the solarsystem's formation," Meyer said.